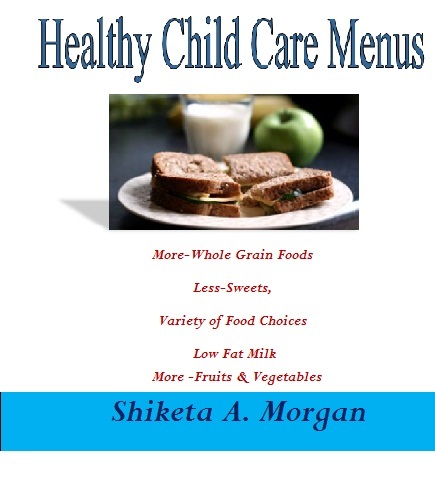 This e-book has been created to provide childcare providers with pre-planned menus that include a variety of foods along with more whole grains and more raw fruits and vegetable choices. Recipe cards are included. Great e-book for parents too! This e-book was designed to provide home daycare providers and childcare center owners with 12 weeks of pre-planned menus that meet the Child Adult & Food Program Nutritional Guidelines. Moreover, to assure that children in your care have access to highly nutritional meals. Also, the menus in this e-book can be rotated every 12 weeks. Moreover, The menus include snacks with more fruit & vegetables, more whole grains choices, low fat milk choices for children ages 12months-12years of age. Furthermore, having 12-weeks of nutritional menus; assures that the children in your Child Care program will be served a variety of food choices and this means less menu planning for you! OH MY Goodness! This is WONDERFUL!!! You have so many different foods included in this, such the variety. You really have a selection of different foods for the children to eat. I love that you have also included the recipes for each week. I so can't wait to try some of the menus and recipes. One being the Mostacolli and the meatloaf, they both look so delicious. The different wraps, seem so easy to make, but different and the kids will love them. The smoothies the kids will love, they will think they are having shakes all the time, something good for them, but so yummy. You have done a wonderful job of putting this all together and for 12 weeks. All the time you have put into this is great. So many different food that I never thought of giving the kids, angel food cake, pound cake. I can already see I will be redoing my menus, when I get some time to set down and plan them out. ~ Nancy Storkel, Owner of Learning Ladder Daycare in Wisconsin. Once again, you have provided us with great ideas; this time in the form of menus and recipes. After reviewing your e-book, I found the recipes to be (1) cost effective (2)nutritious and (3) easy to prepare ! After 20 years , I found myself struggling with menu / recipe ideas. I also loved the recipe cards that can be cut out, laminated and used for years to come! Preview a copy of this e-book by clicking the link above.